Bringing in the Boar’s Head at The Queen’s College, Oxford, from the “Illustrated London News,” 24 December 1846. Here’s a Christmas cornucopia, featuring three songs which I have known and loved for a very long time indeed. I learned ‘The Boar’s Head Carol’ from the Oxford Book of Carols, prompted I think by my friend and singing companion Mike Eaton. I couldn’t swear to it, but I think this was already part of our “wassailing” repertoire before we heard the Steeleye Span recording (it was their Christmas single in 1977). And I reckon I’ve sung it every Christmas since. It’s been in the Magpie Lane repertoire since the very beginning, and is included in our Christmas set pretty much every year; the recording posted here is another from our recent Woking concert. This is a modernized version of the preceding carol [#4: The Boar’s Head In Hand Bring I], and owes its chief interest to the circumstance of its being still annually sung on Christmas Day at Queen’s College, Oxford, where the custom of bringing the boar’s head to table on that day has been uninterruptedly maintained. The ceremony now attending the bringing in the boar’s head at Queen’s College is as follows: — The head (the finest and largest that can be procured) is decorated with garlands, bays, and rosemary, and is borne into the Hall on the shoulders of two of the chief servants of the college, and followed by members of the college, and by the college choir. The carol is sung by a member (usually a fellow) of the college, and the chorus by the choir as the procession advances to the high table, on reaching which, the boar’s head is placed before the Provost, who sends slices of it to those who are with him at the high table; and the head is then sent round to the other tables in the hall and partaken of by the occupants. …and the solo singer gets to keep the orange out of the boar’s mouth, apparently. You can find details on the historical background to the tradition of Boar’s Head feasts in general, and at the Queen’s College in particular, in the New Oxford Book of Carols. The following, from Husk, is reproduced here solely to amuse; not because it is likely to have any basis in historical fact! There was an amusing tradition formerly current in Oxford concerning the boar’s head custom, which represented that usage as a commemoration of an act of valour performed by a student of the college, who, while walking in the neighbouring forest of Shotover and reading Aristotle, was suddenly attacked by a wild boar. The furious beast came open-mouthed upon the youth, who, however, very courageously, and with a happy presence of mind, thrust the volume he was reading down the boar’s throat, crying, “Græcum est,” and fairly choked the savage with the sage. It is perhaps slightly odd that a carol associated solely with an archaic tradition in a single Oxford College – and half of which is in Latin – should have become so well known on the folk scene, and I’m not sure when or how this happened. I suppose some might say that this is evidence of just how divorced the folk revival is from the genuine music of the people. But you could also argue that all it really shows is that folk club singers love a good chorus song, and if it’s singable they don’t care where it comes from. 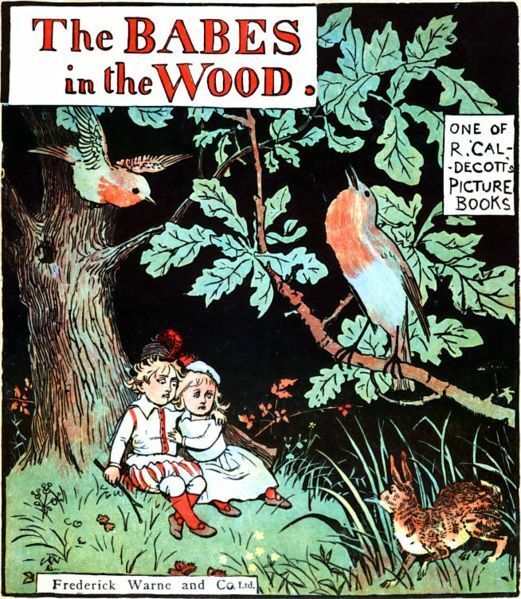 Cover of Babes in the Wood illustrated by Randolph Caldecott (1846-1886), from the Project Gutenberg EBook of The Babes in the Wood. ‘Babes in the Wood’ is from the repertoire of the Copper Family. It tells of two infants who wander out in the woods, get lost, and die – what could be more festive? Of course the story forms the basis of a pantomime (although I have to admit it’s not one I’ve ever seen performed). But the reason this is considered a seasonal song is because of its place in the Copper Family’s Christmas eating and music-making schedule. Here I was going to type up Bob Copper’s description of family Christmasses, from his book A Song for Every Season; but in the event I found the following largely similar account already online, apparently the sleevenotes to a Folk-Legacy LP, Bob and Ron Copper – English Shepherd and Farming Songs. But of all times in the year, of course, Christmas was the season when all members of the family congregated at Grand-dad’s home at Rottingdean. That little cottage would fairly bulge with aunties, uncles, and cousins that we only saw at Christmastime. On Christmas morning, Ron and I had to take the gigantic turkey and a great round of beef down to the village bake-house to be cooked. It was all far too large to be put into the cottage oven. We used to carry it on a home-made wooden affair about six feet long which resembled a stretcher and, walking slowly down the High Street with our load draped in white linen sheets, we must have presented a somewhat gruesome and disconcerting sight. At dinner time, everyone seemed to be flocking round Grand-dad who, as hub of the family, was in a grand, benevolent and expansive mood, smoking a cigar in his favourite holder and sporting a fancy waistcoat — the one with the cat1s-eyes buttons. Everyone was talking, hardly anyone listening, and there was a rich smell of Christmas pudding, cigar smoke and wine, all of which added up to that warm, cheerful, friendly atmosphere I have always associated with the “spirit of Christmas”. After dinner, the older folk would doze in front to the fire, but we used to go for a walk to try to work up an appetite for tea, It was important to have plenty of room for a good tea because every mince pie we ate was supposed to ensure a happy month in the coming year. But with the best will in the world after such a dinner, twelve would be beyond the capacity of even the most enthusiastic. I have managed seven or eight, which would take me through July or August, but by that time my trouser buttons would be so tight that, reluctantly, I had to leave the rest of the year to look after itself. About seven in the evening, grouped in a wide circle round the fire, we would all settle down to start singing. Only carols and Christmas hymns were allowed up until midnight. After that — when it was officially Boxing Day — the rest of the extensive repertoire came into its own. Towards 1 A.M. the ladies started to lay the supper — and what a supper! There was a great round of cold underdone roast beef, a ham and a vast cold rabbit pie covered with golden crust, laced with a flank of bacon and the best part of a dozen hard-boiled eggs all set in a rich, thick jelly. During supper, we always sang “The Babes in the Wood” and, when everyone had a full plate set in front of them, Granddad would strike up, “Oh, don’t you remember…” and we would all join in, interspersing singing with eating and vice-versa, ingeniously maintaining a steady continuity of both. It was really a work of art and only came after years of practice, this singing in relays. I can see Grand-dad now, finishing a line of the song with a piece of rabbit pie poised on his fork, handing over the song to Uncle Tom and consuming the mouthful of pie before taking up the tune again, two lines later, and so on until the song and most of the supper was over. By this time some of us younger ones were practically crying into our supper plates from grief over the story. This custom went on for years and was continued long after the old man’s death. In A Song for Every Season Bob comments at this point “One cannot help thinking that in the interests of everyone’s digestion it was a good thing song had only three verses”. So there you have a song for the approach to Christmas, one to accompany your Christmas Day supper of cold rabbit pie, and finally ‘The King’, a song to accompany (or perhaps replace) your Boxing Day wren-hunting expedition. 1869 replica of an early nineteenth century Pembrokeshire wooden wren house, From the People’s Collection Wales. Why people in various parts of Britain should have got into the habit of hunting a wren on St Stephen’s Day I really don’t know. There are numerous theories on the internet, and just because they’re all implausible doesn’t mean that one of them isn’t true. I recently came across a good article which, in a few pages, gives an overview of the various forms which wren-hunting traditions took, and the songs which accompanied them. This is Hunting the Wren by Phyllis Kinney, in Welsh Music History Vol. 6 (2004) and it’s well worth a read. They are accustomed in Pembrokeshire etc. to carry a wren in a bier on Twelfth Night; from a young man to his sweetheart, that is two or three bear it in a bier [covered] with ribbons, and sing carols. They also go to other houses where there are no sweethearts and there will be ale etc. And a bier from the country they call Cutty Wran. In the Vicinity of Cardigan the following Singular Custom prevails and which is probably of Druidical origin: On the Night of the Fifth of January a Certain Number of Young Men, generally four, take a Wren which is considered a Sacred Bird, and confine him in a cage (which they call his Bier [Elor]) decked with all the Ribbons they can procure from the Girls of the Neighbourhood. With the Wren thus gaudily housed they visit the Families of the District, singing alternate Stanzas in his praise as King of the Birds and as procuring for them many Blessings during the ensuing Year, on account of his being made a Captive and a Victim. ‘The King’ was recorded from two retired schoolteachers, Dorothy and Elizabeth Phillips, from Hook in Pembrokeshire. They also gave first-hand reminiscences of the custom, which they remembered from the 1920s. The wren-party would go to ‘any manor houses in the neighbourhood where they would have food and drink and sometimes money’, during the period between 6 and 12 January, which they called ‘Twelfth-Tide’. The wren-house was ‘a little wooden cottage and dressed with ribbons really crêpe paper and the wren was inside and when they entered the house of course they all looked in and wanted to see the king. The date of this recording is given as 1981, but I’m assuming this was a return visit and that these were the same “two old ladies in Pembrokeshire” from whom Andy Nisbet collected the song in the 1960s. Martin Carthy has recorded this song at least three times in different settings. I learned it, as I’m sure many others did also, from the Steeleye Span album Please to see the King. But Martin had already recorded it with Dave Swarbrick on Prince Heathen (1969). In fact Norma Waterson told me that, a few days after Martin had first heard ‘The King’ from Andy Nisbet, he happened to meet the Watersons at a festival – and immediately taught them this song! A decade or so later, of course, Martin was a a member of the Watersons, and they recorded ‘The King’ on Sound sound your instruments of joy. I’d always thought of it as an unaccompanied harmony song, but in the mid-90s I found myself playing around with it on concertina, and found that it fitted a treat in F on the C/G anglo – which happened to be more or less the key that Ian Giles wanted to sing it in. So it became a Magpie Lane number, and we recorded it on our first Christmas CD, Wassail. Though I say so myself, I was rather pleased with the unexpected chord sequence and duetting clarinet parts at the end of that recording. Although both ‘The King’ and ‘Babes in the Wood’ are Magpie Lane favourites, here I sing them solo, accompanied on my clacketty old wooden-ended baritone Bb/F box. In Under the Greenwood Tree Thomas Hardy describes how a bunch of church band musicians found that their services were no longer required. The same thing was happening in country churches all over the country, as reforming parsons, fired up with the evangelical zeal of the Oxford Movement – and a desire to make their parishes more respectable – got rid of the old, independent-minded musicians, and replaced them with an organ, or a harmonium, or a barrel-organ, and Hymns Ancient and Modern. In many places the old way of singing just disappeared, but it survived in carol-singing traditions in a few places, most notably in certain South Yorkshire villages and at Padstow in Cornwall. The main difference between the traditions in those places is that in Padstow they go out carol-singing in the streets, while in villages around Sheffield the carollers have found a welcome home in the pub – places like the Fountain Inn at Ingbirchworth, the Royal Hotel at Dungworth, and the Traveller’s rest at Oughtibridge. I learned ‘Hark Hark What News’ from a wonderful LP, A People’s Carol, which featured recordings made in the 1970s by Ian Russell at those three pubs, and – in this case – the Black Bull at Ecclesfield. Like all Leader and Trailer LPs, A People’s Carol has long been unavailable, but those traditions and others from the same geographical area are represented on a CD released on the Smithsonian Folkways label, English Village Carols: Traditional Christmas Carolling from the Southern Pennines. ‘Hark Hark’ is on that CD, but it’s the earlier recording which would be one of my Desert Island Discs. Partly because of the presence of a local brass band on verses 1 and 3; but also because, as the singing dies away, a voice off-mic can be heard to say, in a broad Yorkshire accent, “grand old one!”. It is a grand old one, and that comment somehow seems to capture the value which people assign to their local community carolling traditions and, indeed, the importance of all such community traditions, whether involving song, dance, drama or bizarre old customs which are often just plain daft! is the only carol to be repeated during the evening, “Hark, Hark! For latecomers.” It has been sung in the village for as long as anyone can remember. The music is attributed to John Hall of Sheffield Park, a blacksmith who dies in the poorhouse in 1794, and it was probably included in his “Selection of Sacred Music on the Nativity” performed at the Hospital Chapel, Sheffield, 26 December 1792. The text appears in broadsheets and chapbooks from the early nineteenth century, but its author is unknown. ‘Lo! The Eastern Sages Rise’ is sung at Coal Aston in Derbyshire, but this version is derived from the way it is still sung today at Padstow. I was first introduced to the carol, and Cornish carolling traditions, by Graham Kirkham in the late 1980s. It was included on the Veteran tape Rouse, Rouse, a collection of Doc Rowe’s recordings from Padstow released in 1988. That cassette was superseded a few years later by the CD Harky, Harky. I’m not sure if that’s still available, but if it is do try to get hold of a copy, as the singing (and the songs) are quite wonderful. The carol words were written by Jehoiada Brewer (1752?-1817), a Congregational (Independent) minister at Queen Street Congregational Church, Sheffield and Carrs Lane Congregational Chapel, Birmingham; they are set to a tune by Samuel Stanley (1767-1822) of Birmingham. The words – including some verses not retained in oral tradition – can be found on two broadsides printed in Birmingham in the first half of the nineteenth century, and available from the Bodleian Library’s Broadside collection. In both cases the song is entitled The Star of Bethlehem, and the first line is given as “Lo! the Eastern image rise”. This Carol was formerly very popular in the Parishes of St. Agnes, Mithian, and Perranzabuloe — and is still sung there. Variants of the tune exist, with interpolations. The version given here is from the most reliable MS. collections of 1840-1850. Besides singing in the mines, the Cornish miners would sing door to door beginning a week before Christmas. 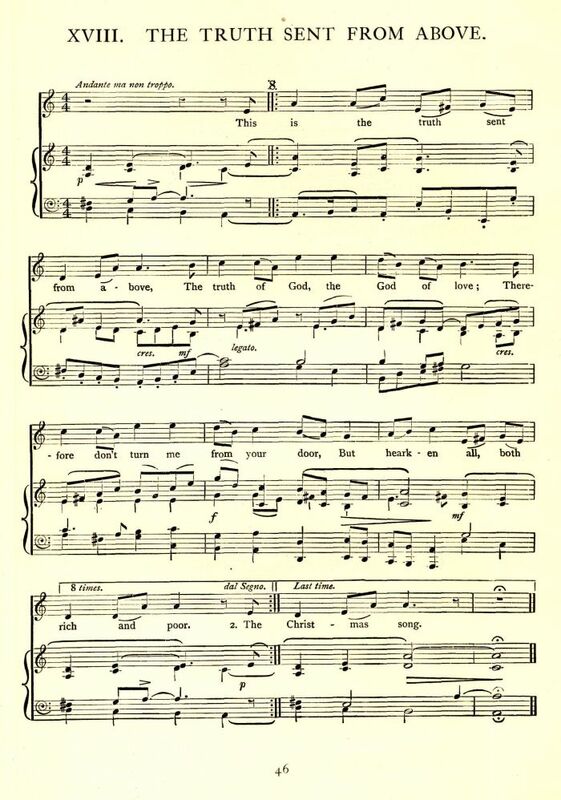 They sang songs popular in Cornwall, England, where they immigrated from, such as “Lo the Eastern Sages Rise,” “Hark What Music Fills Creation,” as well as the better known “Hark! The Herald Angels Sing.” Afterwards, they would visit with the residents and share saffron cake and tea. The two recordings here are hot off the press – recorded at a Magpie Lane concert at the Roman Catholic Church of St. Dunstan, Woking. The term a capella is very loosely – and often erroneously used – these days. But given the acoustics of this church, I think we really were singing a capella last night – I have certainly not needed to added any reverb to these recordings! We were, incidentally, very pleased to be joined on stage by former Magpie Marguerite Hutchinson, who had helped to organise the concert – thanks Marguerite. Magpie Lane, recorded the Roman Catholic Church of St. Dunstan, Woking, 8th December 2012. Now that we’re into advent, I think I’m allowed to post a carol. Actually, although this is a carol, there’s nothing particularly Christmassy about it; like a lot of folk carols it focuses more on the importance of leading an upright, Christian life. The carol is better known I think as ‘Come all you worthy Christian men’, while the editors of the Oxford Book of Carols gave it the title ‘Job’. 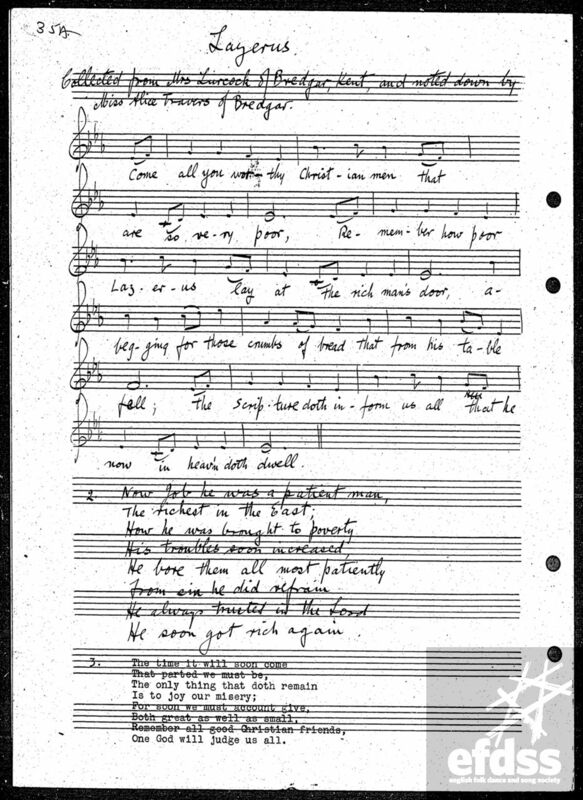 This version is in the Francis Collinson collection, accessible via the EFDSS Take Six archive. It was “collected from Mrs Lurcock of Bredgar, Kent, and noted down by Miss Alice Travers of Bredgar”. George Frampton, who first brought Collinson’s Kentish MSS to my attention, has the singer as Frances Lurcock, and I’ve no doubt he has done the research to back this up. Bredgar is a village just South of Sittingbourne; or, these days, just South of the M2 motorway. I have collated the words with the version in the Oxford Book of Carols, which Sharp collected from Mrs Eliza Woodberry, of Ash Priors, Somerset. I recorded this with Magpie Lane on our CD Six for Gold, and it is in the setlist for our Christmas shows this year – over the next couple of weekends we are playing at Woking, Oxford and Reading; see www.magpielane.co.uk for details.